Publish 69 will be released onto all shards tomorrow morning during the normal shard maintenance windows. It contains, among other things, a number of holiday-related items that need to be claimed before January 25th. Also Thanksgiving Turkeys are being turned off. * 13th year a new rideable Armored Boura. * Be aware that Virtuebane will be looking for any weakness. Town criers will give warning when the towns are about to be invaded. * Due to all the future plans for Magincia we have built a new home for CoM. The new base is located south of Moonglow. Look for the magical spot in the water. * Snow has been added all over the world for the holiday season, enjoy the cold! * We are starting to fill in the areas in the Abyss that are void of monsters, this is only the start but please check out the Abyss. * The Ophidians are attempting to discover the secret to the Bane Chosen’s Blackrock Stew! Will the secret recipe finally be revealed? Allies of the Ophidians are needed to help with the research; you may find the Ophidian cook in the ancient temple in the northern desert of the Lost Lands. * The magic reflection spell will once again be enhanced to provide additional tactical options in player versus player combat. At this time, any targeted non AOE spell, regardless of its circle, can be reflected (excluding Bards mastery abilities). This change will add variety and additional tactical options when fighting a character who has cast magic reflect. The magic reflection spell decreases the caster’s physical resistance and physical resistance cap, while increasing the caster’s elemental resistances. This spell now works off a pool, if you do not have any reserves left in your pool you only have to cast the spell once to replenish it, If you have reserves in your pool you must cast Magic Reflect once to remove the spell and again to re-add the spell. * When a player casts magic reflect they will receive a pool of reflection power which is based off of their magery, inscription, and scaled by their magic resistance. * The level of the spell cast on a target will remove power for the targets reflection pool. The more powerful the spell you cast, the better chance you have of defeating the magic reflection. * If the spell is not successful in bringing down the magic reflect, the spell will be reflected back to the caster. * Once a spell is cast that succeeds in depleting the pool of reflection power, it will damage the target. This is true even if the first spell cast successfully breaks the reflect. * Once a reflect is broken, there is a 30 second delay before the target can cast reflect again to replenish their pool. * Magic reflection will only be removed thru purging or recasting magic reflection with an active reflection power pool. * Items of reflection will take 60 seconds to charge. o After equipping a reflect item there will be a 60 second delay before the reflect is active. o This will use only one charge from the item. o The reflect will act in the same manner as if it had been cast by the character wearing the item. o Once the reflect is broken, the wearer must wait 60 seconds before the item will place another reflect spell. At GM Lumberjacking players will have a 10% chance for a Lumberjacking damage bonus of 100% from base weapon damage. Reduced Death Strike damage delay to 3 seconds from 5 seconds and increased damage scale based on Ninjitsu skill. Death strike damage capped at 50 verses players. Hidden players who have been detected will not be able to rehide/invis for duration based on their hiding skill or magery skill. Players can now only freely detect hidden criminals, murderers, and other aggressor types. o Curse removal no longer based on chance. o Poison reduces healing factor by 15% per level of poison. * Thrown Weapon DCI Penalty for a gargoyle increases as their parrying skill increases. This was not being calculated correctly and has since been corrected. 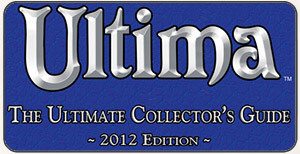 At unmodified 120 Parry players will reduce the DCI penalty to 10%. * Field Spells should no longer have a chunk missing from them when casted on top of an item/person. * Potion weight has changed, full potions weight 2 stones and empty bottles weight 1 stone. * The Fisher in the Britain Library now accepts common Lobsters and Crabs as community collection turn-ins. * Players can now dye leather footwear and quivers using the white leather dye tub. * The mana taken to cast Sacred Journey was not consistent regardless of current mana, this issue was fixed. * Fixed the issue where sails were blocking interaction with cannons and ship pilots. * Fishmonger quests should be removed from the journals correctly when completing the quest. * Ship runes will update on log in if the ships name is changed. * Blue players can now be targeted and attacked by AOE spells, only the targeted blue player will take damage if others are around him/her. * Fishmonger quest crates cannot be removed from the holds any longer. * Stealing from item stacks should no longer cause the items to lose its unique properties. * Pixie costumes will now change you to a pixie instead of a changeling. * Netherbolt and Magic Arrow are not longer spammable to the point where there is more than one of these projectiles in flight at the same time. Attempting to fire one of these still awaiting damage from a previous cast of one of the two will cause the spell to fail. * To remove confusion House Teleporters can no longer be secured by players since they only work when locked down. * Fixed an issue with the Prism of Light Puzzle getting caught in a unsolveable state. * Locked down containers with security set to “Anyone” will now allow anyone with access to the house to drop items in. They will NOT be able to retrieve the items unless they are a Friend of the house or higher! * Polymorphed players killed with AOE spells can report attackers as murders. o Currently hit lower attack proc duration is 10 seconds for all weapons; ranged weapons will now have duration of 7.
o Currently hit lower defense proc duration is 8 seconds for all weapons; ranged weapons will now have duration of 5. * PVP: Corrected auto-defend mechanic that caused Players victims to become the aggressor. * Corrected Faction War Horse issues related to casting spells, throwing bolas, nervestrike, paralyze, and riding swipe. * Corrected damage calculation of special move: Nerve Strike damage is now a little more variable with a chance for zero to ten less damage. * Ninjitsu – Animal Form – Rabbit form no longer requires 20 skill to attempt. * You can now make Snake Skin Boots dyeable by using the Item ID skill on them. * Gargish Dagger now works on dart boards. * Just like Magery, the casting difficulty when using scrolls for Necromancy, Spell Weaving and Mysticism has been lowered by 2 “levels/circles”. o The duration of polymorph-style spells (e.g. Vampiric Embrace) is now a maximum of 3 minutes when the caster doesn’t have the actual skill required to cast them from a spell book. o A minimum of 30.0 in both Necromancy and Spirit Speak is needed to cast Summon Familiar now. * Fixed an issue with Greater Dragons tamed under the effects of buff/debuff spells. This change only affects GD’s tamed after this publish goes live. * Fixed an issue with altered gargish Mace and Shield Reading Glasses not firing off the HLD property properly. * Egg Bombs are now stackable. * Fur Boots can now be dyed using the Leather Dye Tub. * Fixed an issue with the Display Case not displaying the correct graphics (an edge is missing) when placed next to each other. * Fixed an issue with T-map guardians spawning in Ter Mur homes. * The chance to discover a Niter Deposit is now doubled. * Fuse chords that are attached to a cannon can now be removed. * Fixed an issue with how Bottle of Ichors can’t be crafted from Darkglow Potions inside a potion keg. * Added the texts “Requires Stygian Abyss” to SA artifacts. * Fixed an issue where Pet Summoning Balls cannot be purchased from player vendors using the context menu. * Fixed an issue with rugs being non-removable from a packing crate. * Players can no longer use ward removal from talismans on themselves to bypass the magic reflect cool down timer. * Increased community collection points for crabs and lobster from 1 to 10 each. * Fixed an issue where some metal weapons and armor where not dye-able with the metal dye tub veteran reward. * Added metal chest to the dye-able item list on the metal dye tub veteran reward. * House owners can now dye metal items that are locked down using the metal dye tub veteran reward. * Fixed issue with colors on certain pieces of equipment in the Classic Client. * Added new User Setting option “Save Journal to File” for logging journal text to a file (in \logs\chat.log). * Text logged to the file now append instead of overwrite the file. * Spellbooks and containers on the hotbar no longer become invisible in the backpack when sailing across a server line. * Item tooltips will now update properly if the properties of the item change while the tooltip is showing. * Items will no longer get stuck in the corners of containers in Legacy container view. * Gold stacks dropped at the bottom in Legacy container view will no longer appear lower than it should be. * NPC shopkeepers will display correct inventory after an item is sold out. * Being resurrected quickly after death will no longer get stuck in the grey screen state. All in all, a pretty exciting publish! 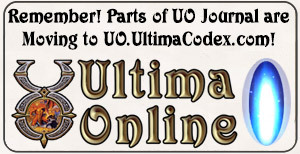 UOJ Note: The two images posted with this article, the UO Santa originally appeared on UO.com prior to 2005. The Snow image was from UO.com in December of 2006.